Imagine thinking you know someone and finding out you really don’t. Having them be a part of your life for 18 years, and then finding out something about them that astounds you. That’s what happened to me last week – I’m still sort of dumbfounded. My husband, the man I trust with my life and my children’s, confessed to me that he thinks pumpkin only belongs in pie. Not definitely not in ice cream. He says pumpkin is for pie. And only pie. WHAT?!? Are you kidding me? When were you saving that bombshell for? Our 20th anniversary? For the past few years I’ve prepared pumpkin in numerous ways. I love the smell of baking pumpkin with the lingering notes of cinnamon, cloves, ginger, and nutmeg wafting through the house. I love how it adds moisture to baked goods and how it provides a natural orange tinge to everything it gets used in. And I do love stopping by the coffee shops in autumn to savour a delectable pumpkin spice latte. Then, to find out this is something we don’t have in common. What a shocker. It’s a good thing I love that man, this will just have to be an imperfection that I will learn to overlook, while I’m sharing a piece of Crustless Pumpkin pie with him. And it’s a good thing that my kids love all things pumpkin as much as their Mom. It gives me a reason to keep on creating new recipes – like these gluten free Baked Pumpkin Chocolate Chip Doughnuts – for us to enjoy. Please forgive me for having a recipe that makes 8 doughnuts. I know a standard doughnut pan makes 6, but sometimes when a recipe works, and is good, it's just best to break out that second pan. Preheat the oven to 375 degrees F. Grease your doughnut pans. In a large bowl, whisk to combine the rice flour, sorghum flour, potato starch, dry milk powder, tapioca starch, baking powder, pumpkin pie spice, xanthan gum, salt, and mini chocolate chips. In a smaller bowl, whisk together the pumpkin puree, brown sugar, oil, eggs, and vanilla. Spoon the batter into a large resealable bag. Cut a hole in one of the corners of the bag, and pipe the batter into the prepared doughnut pans. Bake in preheated oven for 12-14 minutes, or until the top of the doughnut bounces back when gently pressed on. Let the doughnuts sit in the pan for 5 minutes before removing them. These can be served warm, or stored in an airtight container once cooled. The sugar/cinnamon mixture will dissolve once they are stored in a container. Although this recipe is for doughnuts using a doughnut pan, you can always use a muffin or mini muffin pan instead. You may need to adjust the baking time according to the size of the pan. 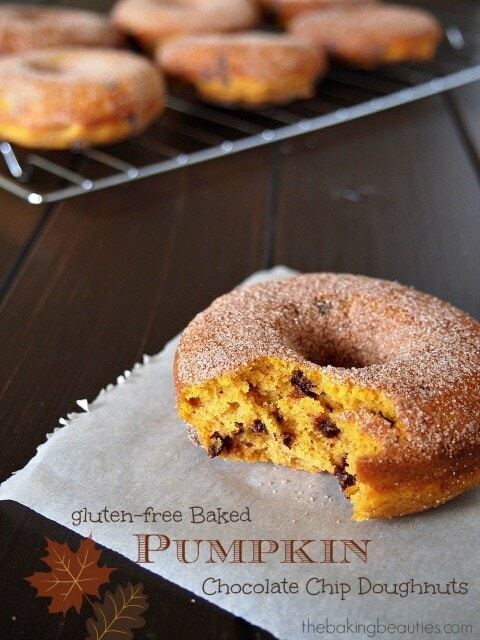 Looking for MORE GLUTEN FREE PUMPKIN GOODNESS? CLICK HERE! Looking for MORE REASONS TO PURCHASE A DOUGHNUT PAN? CLICK HERE! Now as far as this recipe, it’s perfect timing! I was looking for a great new donut recipe for All Gluten-Free Desserts. Found it!! Ha, I don’t get them either, Shirley, but I guess they exist! 🙂 Thank you so much for sharing at All Gluten-Free Desserts, I appreciate it! LOL if this his only secret you are in good shape. Too funny! These look fabulous, Jeanine! Thank you! I’m so glad that was a happy bombshell, phew! Congratulations on winning the Great Cream Challenge!!! These look wonderful, Jeanine! You have outdone yourself again! Mr. T and I are headed off on a little getaway this month and I may just bake these to take along. So happy to hear that your marriage is okay in spite of this “incompatibility issue” and that your kids like pumpkin too. Thanks again for your baking expertise and all of the great recipes you share. My pleasure, Mrs. T! Enjoy your getaway, a break from the everyday is always nice. I love pumpkin donuts!..I enjoyed the story you shared..the things we learn!! 😉 I am with you, I love pumpkin in almost anything! “Almost” being the key word, right, Betty? Have them in the oven right now! Can’t wait! Did you ever do a cider donut? My daughter has been asking me to try and make them. Oddly enough, I feel the same way about pumpkin. I used to like it in pancakes, etc, but in the last two years or so it just makes me sick. My husband loves it though, so I’m going to make him these. I’m such a sacrificial wife:) Thanks for your fantabulous recipes, I’m sure he’ll love this one! Oh Jeanine my husband is the same way……he did not grow up eating pumpkin in different ways…I dont think he even ate pumpkin pie as a kid(traditional italian family). I love pumpkin in many forms….soups, desserts etc. It is also really good for animals with a sick tummy. Recently I found pumpkin seed nacho chips at our Costco store…..talk about yummy! He looked at me like I was nuts when I held them out for him to try! He eventually did try them and ate several handfuls so I think they passed his taster…lol. This donut recipe looks tasty and I cant wait to give it a try! After (finally) buying a doughnut pan I made these doughnuts yesterday. My pan came in the mail at around 4 pm and by 7:30 we were eating doughnuts (had to make supper first)!! YUM! My 10 year old, a self proclaimed doughnut hater and gluten eater, said they were the best doughnut he had ever eaten. They were soft, moist, and spicy. I made a double batch and had enough for us to enjoy them for breakfast. This morning, I rerolled them in the sugar and cinnamon mix since they had melted the sugar on the outside. They were perfect paired with my Pumpkin Spice coffee this morning! Thanks for another great recipe!! Made these again yesterday for a brunch group I had over. I am the only GF eater of the group but they all LOVED them and couldn’t believe that they were GF. Oh my, I tried these last week and they are amazing! Jeanine, I honestly don’t know how you come up with these fabulous recipes that work so well. I have tried recipes from other gluten free sites and I have been disappointed (or maybe underwhelmed is a better word) with the results. I honestly thought that gluten free muffins would always be squishy, and gluten free bread always hard and crumbly, until I found your site. I am so thankful. My doughnut pans were given to me by a friend and they are more like mini angel cake pans, but they did work. Some of the cups were filled too full and so the doughnuts came out more like little cakes, but I shared one with my hubby and we both agree — fantastic. Now he will not feel guilty buying the occasional doughnut because he knows there are some in the freezer for me to enjoy. For future reference, how full do you suggest filling the indentations/cups in the doughnut pan? Ah, Mrs. T, you’re very welcome! I’m so glad that you’re having great success with so many recipes too, and love that you enjoyed the doughnuts. 🙂 Thank you so much! I have been to 3 grocery stores to get all the ingredients and went to 3 places trying to find donut pans before I had to order them on Amazon, but dang it, I am making these donuts this weekend! Sooo excited to have found this blog. I had to go gluten free in January and have been bummed about missing out on all the pumpkin yummyness this fall. But no more! If I do well on the donuts, the pumpkin cheesecake is next! I loved your post! Great sense of humor! I cannot get sorghum flour in my area. Would Arrowhead multi purpose flour be okay as a substitute for all the flours? Or…I have brown rice flour, white rice flour, potato starch and tapioca starch. Thanks! I’d like to make these. I think you could just sub in the brown rice for the sorghum. I haven’t tried it that way, but that would be my guess. Enjoy! I would really like to try out this recipe but I also cannot eat dairy. Do you have any suggestions for me to replace the milk powder? You can substitute with 2 Tbsp dry vanilla pudding mix (Jell-o brand is dairy free, I believe), or 2 Tbsp of almond flour. Or, you can omit it, I think it’d work find without as well. I just read your recipe for chocolate donuts and it sounds amazing!! That recipe calls for the chocolate pudding recipe OR dry milk, could you use a vanilla pudding mix for this one too? Also does this have to have the chocolate chips or can I omit them? I used coconut milk powder to replace the milk powder, used coconut oil to replace the canola, use 1 teaspoon of chia meal and 6 tablespoons coconut yogurt plus 2 tablespoons hot water to replace the eggs. I also used palm sugar and part stevia to replace the brown sugar. You had me at pumpkin! Thanks for linking up at our Gluten Free Fridays party! I have tweeted and pinned your entry to our Gluten Free Fridays board on Pinterest! 🙂 I can’t wait to see what you share this week! Its LIVE! Can I use an egg replacement instead of the 2 eggs? I’ve never tried it, Connie, if you do, please let us know how it works! Just made these donuts and they turned out so good. I didn’t have dry milk, so I omitted it. I also did not have potatoe starch so I used arrowroot. They still turned out very good. My 7 year old son loves them.